Hard-to-find decorative baseboard registers available in three sizes. Each baseboard vent comes with an adjustable multi-shutter damper. The baseboard vent comes out from the wall 7/8 inch. Tip: Do not measure your old metal baseboard registers, measure the size of the wall opening to determine the size register needed. Baseboard vent sizes listed are for the hole size they fit, total outside measurements can be found in the table above. 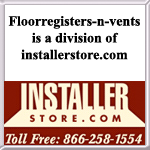 Find other rectangular baseboard vent options available on our site. 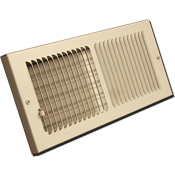 This durable Shoemaker baseboard vent can also be purchased in a driftwood tan (brown) finish. Purchase this hard-to-find decorative baseboard register today!